Intellian has announced that SES Networks has endorsed Intellian’s 2.4 meter, multi-band, MEO and GEO broadband antennas that provide seamless access to virtually any satellite constellation within seconds for use on their Ku-, Ka- and C-band satellites. These frequency-agile and orbit-agnostic capabilities, enabled by Intellian’s antennas and the firm's new Intelligent Mediator Solution, ensure that the equipment’s capabilities are future-proof for customers seeking the fastest and most reliable broadband connectivity. 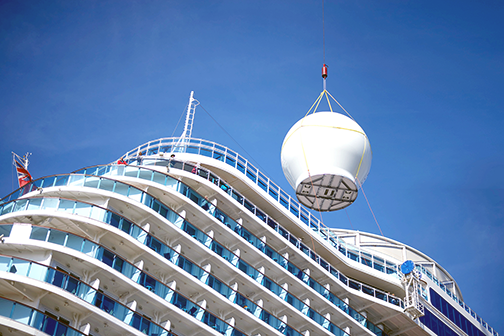 The v240MT antenna being installed on a cruise ship. Photo is courtesy of Intellian. The new Intellian v240MT solution provides the unique capability of switching between different satellite frequency bands as needed without any user intervention required. This, then, ensures the best solution for the geographic location and flexibility in achieving the highest throughput. Intellian’s solution, when combined with SES Networks’ satellite-based services, provides truly global, tri-band, multi-orbit coverage that delivers connectivity scaling from 100 Mbps through to multiple Gbps of dedicated capacity to a single vessel. Intellian v240MT systems have already been installed globally on a number of vessels and are now available for shipment from Intellian’s worldwide logistics centers. Stewart Sanders, EVP of Technology at SES Networks, said that the company is very focused on solutions that optimize the user experience. As the only satellite operator offering communications services that leverage GEO and MEO satellites, SES strongly believes that a multi-orbit, multi-band maritime solution delivers the optimal combination of performance, reliability and, ultimately, user experience at sea. The capabilities of Intellian’s new antennas contribute to a frictionless user experience and they have the potential to enable our customers and their end users to fully benefit from our unique multi-orbit approach. Eric Sung, CEO of Intellian, commented that the company is proud to have managed to deliver the world’s first tri-band and multi-orbit antenna to the industry. The collaboration with SES Networks has enabled Intellian to connect vessels with an innovative and powerful solution that delivers record-breaking connectivity speeds across all satellite frequency bands with the introduction of the v240MT system.